“El Chabacano, un poquito de Español”. So goes a line of a popular Chabacano de Zamboanga song simply titled “Chabacano”, referring to the creole Spanish which is considered one of Zamboanga’s cultural treasures. Preserving and promoting the popular use of this creole Spanish was the focus of a National Chabacano Conference held on November 19-20 in Zamboanga City, with the theme: “Chabacano Language Today: Commemorating the Philippine-Spanish Friendship Day 2010″. Conference participants were mostly from the academe – elementary, high school and college levels, media practitioners and other Chabacano language enthusiasts. Dr. Emmanuel Calairo, Dean, College of Liberal Arts, De La Salle University, Dasmariñas, Cavite and Project Director and National Convenor of the conference informed that the Philippine-Spanish Friendship Day was first celebrated in Cavite in 2009. In his keynote address, Hon. Cesar Virata, President of the Cavite Historical Society and former Prime Minister of the Republic of the Philippines, recognized Chabacano as one of the oldest creole languages in the world and the only creole Spanish in Asia. The Chabacano-speaking localities in the Philippines include Cotabato City (Tamuntaca), Cavite City, Ternate (Cavite), Ermita (Manila), Davao City, Basilan Province, Zamboanga City, Margosatubig in Zamboanga del Sur, and some other localities in the Zamboanga Peninsula. However, Zamboangueños remains to be the largest Chabacano-speaking population in the country. In her welcome address, WMSU President Dr. Grace J. Rebollos tagged the gathering as a “celebration of our sacred language” which manifests the stakeholders’ efforts to keep the language alive and well. She likewise invited everyone to look at Chabacano, which is the fastest growing creole language, as “a way of life”. Likewise, Hon. Celso L. Lobregat, Zamboanga City mayor, proudly presented some books which help promote and preserve Zamboangueño culture including Chabacano language. These books include The Roots of Asia’s Latin City by Dr. Hermenegildo Malcampo by; Chabacano-Spanish Dictionary by Dr. Rolando Santos; Chabcano Handbook by Mr. Bernardino Camins; English-Chabacano Dictionary by Fr. John Chambers; Dictionario Chabacano-Filipino-English the publication of which was commissioned by the Komisyon ng Wikang Filipino (KWF); and El Primer Alfabeto Chabacano by Dr. Roberto Torres. The conference boasted of personalities who are currently passionately giving their share of work for the preservation of the Chabacano language. Dr. Hermenegildo Malcampo, historian and a retired Head of the Spanish Department of WMSU who writes a Chabacano column for a local newspaper, spoke on the topic “Asunto Historico del Lenguaje Chabacano”. Based on history, he said that Chabacano was born in 1665 when the Filipinos (then called ‘Indios’) who were mostly Visayans, Ilongos and some natives from the neighboring areas in the Zamboanga Peninsula, were brought in for the construction of Fort Pilar. Dr. Malcampo explained that in order to facilitate communication, Filipinos incorporated Spanish words into their own dialects including words from each others’ native tongue. Thus was born a creole Spanish called Chabacano de Zamboanga. The conquistadores did not bother to teach the natives how to speak pure Spanish. It was not part of their agenda. Hence, Chabacano flourished. Dr. Roberto B. Torres, Director of WMSU Office of Culture and the Arts and a former Spanish teacher talked on the Chabacano language preservation efforts of the Zamboangueño community through his topic, “Maga Esfuerzo del Gobierno Sobre el Chabacano”. He highlighted on City Ordinance No. 109 which was enacted in 1990. According to Dr. Torres, the law mandates preservation, restoration and promotion of the dialect, history and culture of Zamboanga City by all Zamboangueños. The ordinance, Dr. Torres revealed, has given birth to the Local Culture, Arts and Historical Council of Zamboanga City. The council is tasked to implement the ordinance. He also underscored concerted efforts of the city government, the academe, the church, the media outlets, business establishment, concerned individual citizens and many others, which surely gaining grounds. This is sevidenced by the increasing number of Chabacano literary works being published, the use of the language in posters, sinages, and advertisements, among others. Meanwhile, Dr. Julieta Y. Tabacug who finished her Doctor of Philosophy in Education, Major in Language Teaching degree from the University of the Philippines-Diliman, and retired as Vice-President for External Affairs and Open University System of WMSU in 2007, tackled the topic on “Creolized Form of Chabacano: A Socio-Linguistic Phenomenon in Language Development”. She cited the results of a studies which revealed that learning among children is enhanced through the use of their first language as medium of instruction; and that if the mother tongue is in written form, the faster is its promotion and preservation. Hence, she made the following recommendations in order to preserve the Chabacano language: vernacular teaching in the primary grades; production of primer and handbooks; translation of stories and essays into Chabacano to be done in thought units; publication of more creative and literary works in Chabacano; conduct researches on the local utilization of spoken and written Chabacano to come up with an updated Chabacano dictionary. A native Zamboangueño and a language researcher and scholar who is now residing in the United States of America, in the person of Dr. Rollie Santos, presented a Chabacano Spanish dictionary which he wrote and recently launched at the Ateneo de Zamboanga University. Prof. Josephine Cruz and Dr. Enrique Escalante presented the history of the birth of Chabacano in Cavite. They likewise presented the language preservation efforts in their locality which included literary and writing contests in Chabacano, special Chabacano classes for both young children and adults, Navidad (Christmas in Chabacano), and comparsa (choir with fancy drill) among others. Dr. Escalante also presented a lesson plan and strategy in teaching Chabacano. They admitted that Caviteños who still speak Cavite Chabacano is almost nil and that there is so much more they need to do to save the language from utter demise. Prof. Kalbi Asain from Sulu province presented the results of a study he conducted titled “Potential Factors Affecting the Diffusion of Chabacano in Southern Mindanao”. He identified the following as some of the factors, namely, growth of colleges and universities in the city where students from Sulu study and get in contact with Chabacano; commercial boom in the city which attract traders from Sulu; accessibility of government services in the city encourage people from Jolo, Basilan and Tawi-Tawi to transact business in Zamboanga instead of going to Cotabato City; intermarriages; diaspora of Joloanos to Zamboanga during martial law forced them to stay in Zamboanga where they had to learn Chabacano; rapid progress in transportation and communication; tourism; good and credible medical services attract other ethnic groups to come to the city for medical treatment; and geographical proximity of Zamboanga to other localities in the region. Zamboanga with the inclusion of more words from other dialects which now flourish in the city. However, one of the resource persons pointed out that Chabacano is a living language and very dynamic. As such, this phenomenon is inevitable, he explained. At the end of the conference, participants from Zamboanga City formed the Consejo de Lenguaje de Zamboanga. This 20-member ad hoc committee is headed by Dr. Roberto B. Torres as chair. The committee is now in the process of formulating its vision, mission and goals as well as the organizational structure to guide its operations. 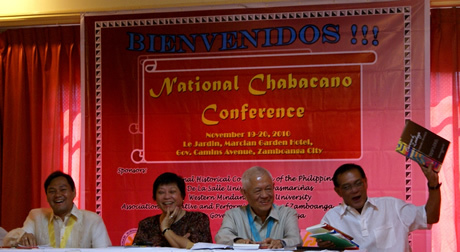 The next national Chabacano conference is slated in October 2011 in time for the Zamboanga Hermosa Festival, during which a national Chabacano council will be hopefully organized.